How do I charge my Roadster 2™ hands-free speaker? How do I charge my hands-free speaker? 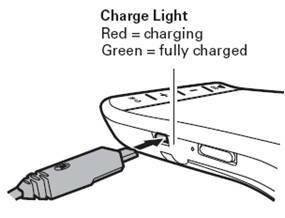 Plug the Motorola charger into the charging port on the end of the hands-free speaker (as shown below). The indicator light turns red when the battery is charging. It may take up to 1 minute for the indicator light to turn on. When the hands-free speaker's battery is fully charged (about 3 hours), the indicator light turns steadily green. Your speaker is operational while charging; however, it is not recommended to charge your speaker while clipped to your sun visor. Your battery is designed to last the life of your product. It should only be removed by a recycling facility. Any attempt to remove or replace your battery will damage your car kit.